November was a great month here at Sisters! We did some awesome weddings and receptions! 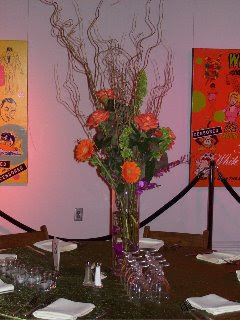 Here are some snapshots that we took while setting up at the Mad Art Gallery and Westborough Country Club. This destination wedding reception at Mad Art Gallery had all the elements of a tropical island dream! 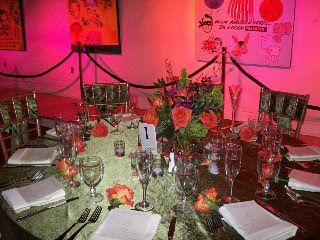 The warm colors of the flowers and decor helped bring the tropical location of the ceremony to St. Louis in November! The gallery walls were washed with pink and orange light. All the flowers had orange, lime green and hints of purple. Half of the tables had tight, cube arrangements. 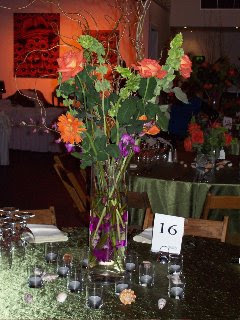 The other half of the tables had tall cylinder arrangements with curly willow and brightly colored flowers, including orchids. This reception, at the Westborough Country Club, made great use of our trees and crystals! 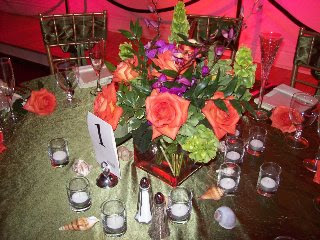 One-third of the guest tables had decorated trees, while the others had lush cube vases. The trees were decorated with white hydrangea on the top and at the base with our crystals and hanging votives. The cocktail tables had small cube vases in the wedding colors. Special thanks to Ashley & Jeremy and Sandra & Nathan! We enjoyed working with you and we wish you all the best in your newly married lives! !